Clear, or transparent, cards are a rarity in puzzles and games, but they offer a terrific gameplay mechanic: the ability to stack cards without obscuring information. The clear cards in the storytelling game Gloom allow players to add and subtract points from various characters as the grim and whimsical stories unfold. The quick-play pattern-matching game On the Dot — which was part of last month’s Tabletop Tournament — challenges players to properly arrange four clear cards — each with randomly-placed colored dots — in order to match a given pattern before their opponents do. Now, the creative minds at ThinkFun have put a wonderful, vibrant twist on the clear-card genre of puzzles and games with their latest release: Kaleidoscope Puzzle. 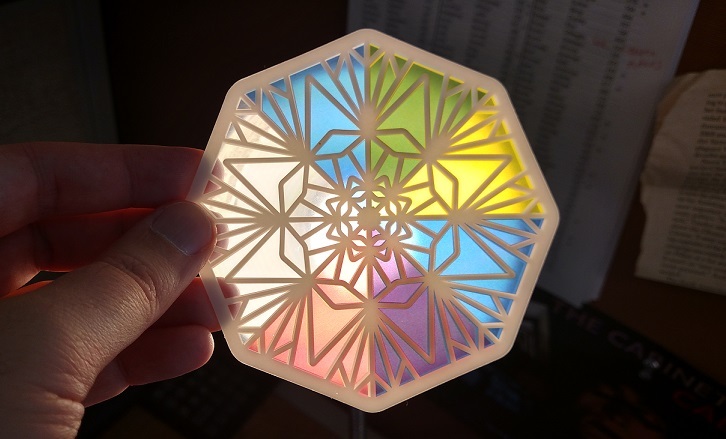 In Kaleidoscope Puzzle, you have six octagonal tiles, each with its own pattern of tinted and clear quadrants. It’s up to the solver to arrange either two or three of the six tiles in order to recreate the patterns on the challenge cards. First off, I want to say that this might be the most aesthetically pleasing puzzle I’ve ever solved. Just turning the kaleidoscope cards in my hands in front of a light is enjoyable, letting the snowflake-patterning on each card blur and come into focus anew as the cards line up, each time matching and mixing the various colored quadrants to create eye-catching effects. It’s brilliant in its simplicity, and unlike any color-based puzzle I’ve seen on the market today. It almost feels like putting together a stained-glass window, particularly as the challenge cards progress and the patterns grow more elaborate. The Beginner challenge cards help to familiarize you with the gameplay. You quickly figure out placement and color combinations. As you transition into the Intermediate challenge cards, the patterns grow more elaborate, and honestly, more beautiful. 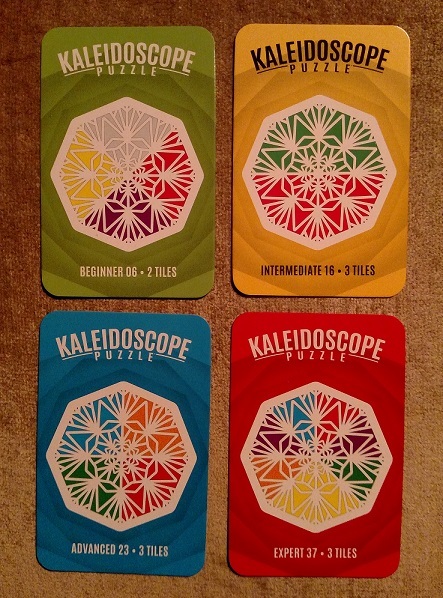 It’s amazing the combinations you can conjure with just two of the six possible kaleidoscope tiles! 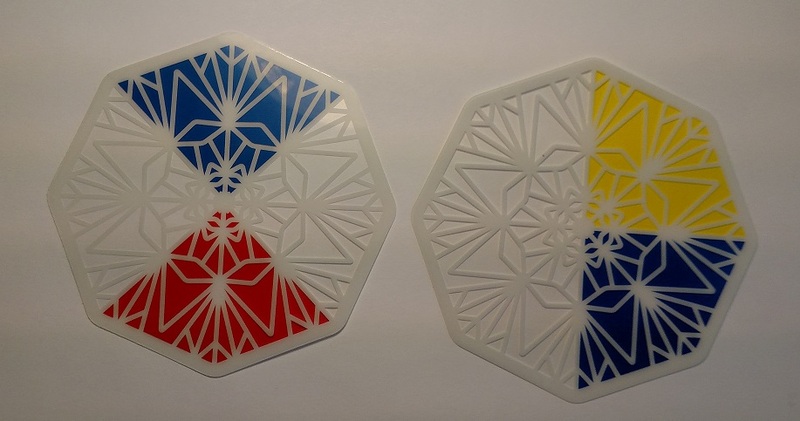 Halfway through the Intermediate challenge cards, they ratchet up both the possibilities and the difficulty, as you now have to create the patterns with three kaleidoscope tiles. Now you’re trying to cover all four quadrants with color patterns, and it becomes about maximizing what each tile offers. 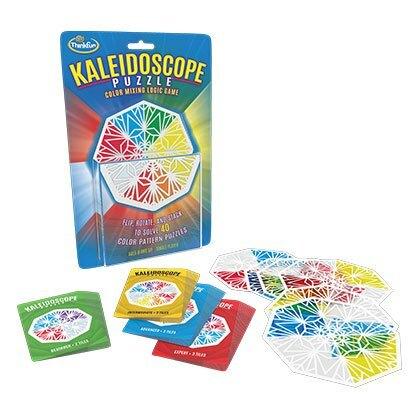 But it’s in the Advanced challenge cards that the game really separates itself from On the Dot-style solving, because Kaleidoscope puzzle has the color-mixing element as well. Not only are you manipulating the kaleidoscope tiles to place the basic colors where you need them, but you also need to create green, orange, and purple patterns as well. Toward the end of the Advanced challenge cards, you start to deal with eighths instead of quadrants, divvying up the field into increasingly more complicated designs, reminiscent of pie charts. Sometimes, you might discover alternate ways to form the patterns, which is very satisfying indeed. It also speaks to how adaptable the six kaleidoscope tiles are, since you can arrange them in seemingly endless combinations. By the time you reach the Expert challenge cards, you’ll be turning, flipping, and rearranging these tiles like crazy to form the intricate patterns on the cards. It’s an unexpectedly relaxing form of puzzling, a meditative mix of challenge and aesthetics. I cannot say enough good things about this puzzle. 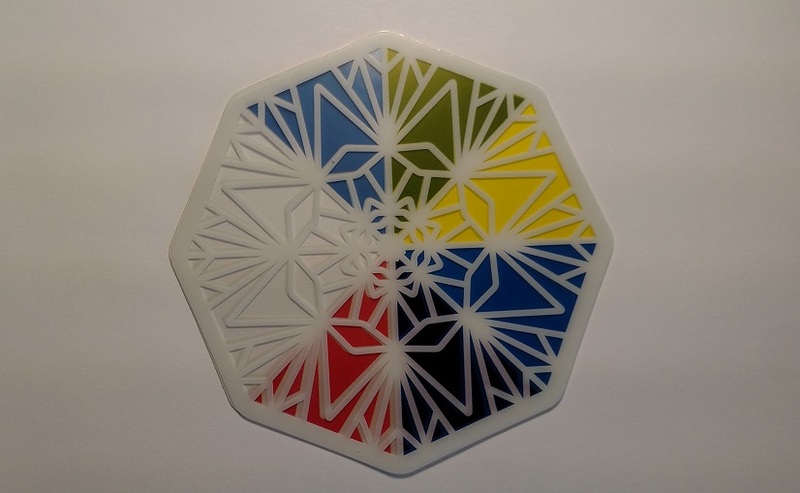 Mixing the resource management of how to get the most out of each tile you choose with the striking visuals of the kaleidoscope tiles makes for a unique solving experience. Puzzles that are as satisfying to look at after the solve as they are to solve in the first place… that’s a true rarity. What a treat. This entry was posted in Games, PuzzleNation, Puzzles and tagged Brain teaser, card game, color, color matching, games, Geeking Out, Gloom, kaleidoscope, kaleidoscope puzzle, logic, logic game, on the dot, Pop culture, product review, puzzle game, PuzzleNation, Puzzlin' fool, stained glass, ThinkFun by gmdirect. Bookmark the permalink.